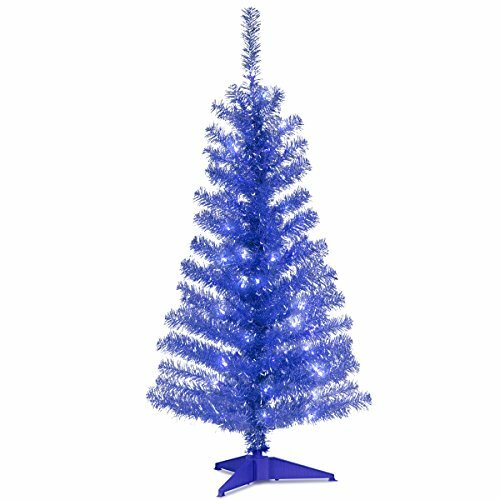 National Tree 4 Foot Blue Tinsel Tree with Plastic Stand and 70 Clear Lights (TT33-307-40) by National Tree Company at Two Clock. MPN: TT19-307-40. Hurry! Limited time offer. Offer valid only while supplies last. Tree measures 4 ft. tall with 24'' diameter. Pre-strung with 70 UL listed clear lights and has 110 branch tips. Matching color three leg tree stand. Tree measures 4 ft. tall with 24" diameter. Pre-strung with 70 UL listed clear lights and has 110 branch tips. Matching color three leg tree stand. Light string features BULB-LOCK to keep bulbs from falling out. If one bulb burns out, others remain lit. Fire-resistant and non-allergenic. Includes spare bulbs and fuses. Packed in reusable storage carton.